Holes in the wall are the pits! Make them disappear seamlessly with this foolproof five-piece repair kit from Hyde Tools. What do you do when you find yourself staring at a hole in a wall caused by a furniture ding, a too-eagerly opened door, or some other everyday “oops” moment? The short answer is, you repair it. But even handy homeowners know that seamlessly patching a wall is anything but simple. First you gather up the necessary materials, then you probably head off to the hardware store when you realize that your leftover spackling compound has dried out. Even after you finally finish the repair, your so-so results may tempt you to hide the fix behind some strategically placed artwork. Read on to find out how the remarkable quintet of supplies included in the Better Finish Wall Repair Patch Kit (available at hydestore.com; $11.99) can help you disguise dings, divots, and depressions, leaving your walls move-in ready in minutes. Savvy DIYers know that fixing substantial holes in interior walls is easier with a wall repair patch kit. Without one, you need to resort to the old-school patching process: widening the hole into a square with a drywall saw, cutting a piece of drywall to fit that hole, screwing small lengths of wood to sit behind the hole to hold the patch in place, screwing the patch into these wood supports, and then covering the new seams with drywall tape and joint compound. Garden-variety wall repair patch kits, however, can fall short. The gritty spackling compound included can be a downright chore to apply and sand, the 2-inch plastic compound knives are too small to cover medium-size voids, and the mesh repair patches themselves require a sizable amount of spackling compound to hold them in place and fill in the grooves. 1. Position and stick the self-adhesive patch so that it completely covers the hole’s edges. The perforated aluminum patch will remain securely in place over the wall without the need for any wood supports behind it! 2. Twist the top to puncture the joint compound tube, remove (and save!) the stopper, then squeeze. Line the perimeter of the patch with a thin bead of compound, and then draw an X across the center. 3. Spread the compound using the 6-inch joint knife. The spreader’s generous size will make it easy to get a thin, even layer over the entire patch—it’s the exact blade width that professionals recommend and use to repair four-inch holes. 4. Once the patched area is dry, lightly sand any raised spots. 5. Apply a second layer of compound over the patch, and spread it completely smooth. 6. Finally, reseal the tube so it will be ready for the next mini emergency. Then, just paint over the patched area to erase all traces of the hole. While conventional nail hole fillers do cover up imperfections, they can lead to a flawed finish on small patching jobs. Sometimes they dry and shrink too quickly after application, leaving a hole that looks only partially filled; other times they harden or crack after curing. The particularly moist and smooth drywall compound formula included in the Better Finish Wall Repair Patch Kit enables it to fully and easily cover the perforations in the metal wall patch and maintain its structural integrity even after drying, ensuring a crack-free, virtually invisible patching job. Unfortunately, even a perfectly smooth spackled patch can still look like an obvious repair. Under a fresh coat of paint, an uneven sheen known as flashing can show through at the site of a repair if the patching compound you’ve used doesn’t match the porosity of the wall. Flashing is all but inevitable when you use spackling compound to fix a hole on drywall that was taped with joint compound. 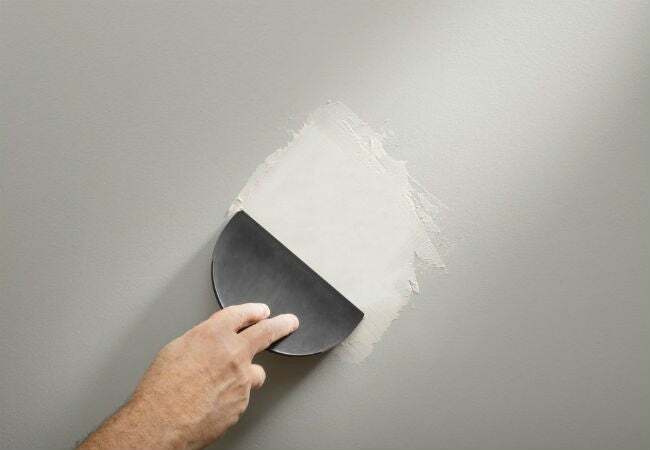 Here, too, the Better Finish Nail Hole Filler Joint Compound that’s included with the kit lives up to its name: Because it’s made of the same smooth compound used for drywall taping, it blends into the surrounding wall and promises a flawless finish, even after painting. When you purchase traditional wall-patching tools and materials à la carte, you can burn a hole in your wallet and wind up with more stuff than you need. Moreover, if you’re just an occasional do-it-yourselfer, chances are good that the 75 percent of the tub of spackle that remains after the job will dry out before the next fix, and you may never have need of a drywall saw again. If you opt for the affordable Better Finish Wall Repair Patch Kit, though, all you’ll carry home is one lightweight and compact tool kit. Even better, the resealable Better Finish Nail Hole Filler Joint Compound has a three-year shelf life. Because it won’t dry out in its patented tube or gum up the included sheet of sandpaper like conventional patching compound, the Better Finish Wall Repair Patch Kit may very well be the last patching product you buy this decade! Considering that each tube of joint compound can fill a whopping 300 nail holes, it’s safe to say that you’ll have some left over to patch a cracked ceiling, fill in the holes after you rearrange a gallery wall, smooth over dinged hollow-core doors, and repair a host of other interior surfaces. As well, thanks to the compact size of the pieces, the kit’s easy to store between uses. You can stash it in your toolbox, a desk drawer, or someplace else close by so you can grab it for your next unwelcome “oops” moment. 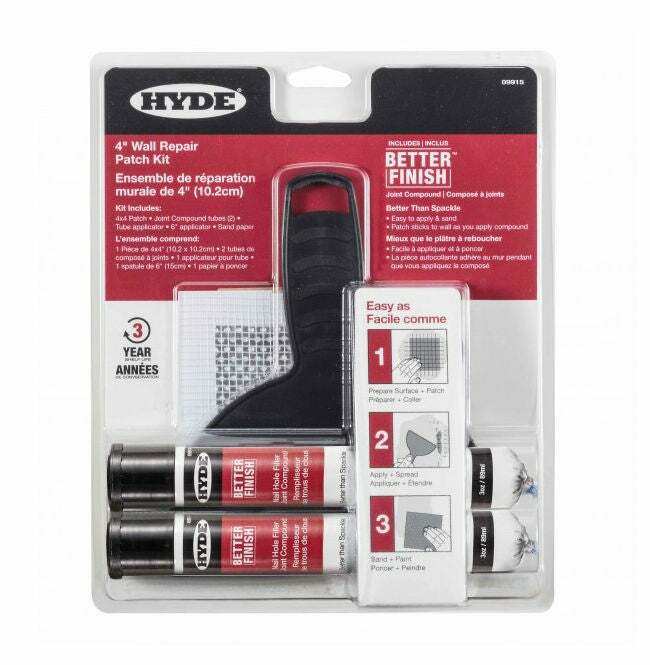 Purchase the HYDE Better Finish 4-inch Wall Repair Patch Kit from hydestore.com for $11.99.